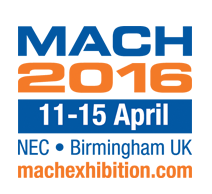 Seven of our Production team are visiting Mach 2016 in the NEC in Birmingham this week to see the latest and greatest in engineering and manufacturing technology. MACH is the biennial exhibition & showcase for advances in the UK manufacturing industry, run by the Manufacturing Technologies Association (MTA), a UK based trade association dealing specifically with engineering based manufacturing. The exhibition brings together all the best innovations and latest developments to come from the manufacturing technologies sectors. The 2016 exhibition hopes to host at least 25,000 quality visitors who represent many diverse sectors across the UK Manufacturing sector. There will be over 600 companies exhibiting with bigger and better new zones, innovations in technologies and a hugely popular seminar program encouraging advanced manufacturing techology. MACH is the major showcase for the advanced manufacturing industry in the UK and it is organised by the Manufacturing Technologies Association (MTA), a UK based trade association. The aim is to bring together a range of the latest innovations and best developments from the manufacturing technologies sectors all in one place. The many seminars taking place over the week last about an hour each with a Q&A session and offer a hugely informative insight into advanced manufacturing technology.